Thanks to my dear old friend Leslie Anne who tip me to the LCBO’s website where they have an amazing selection of carrot cakes, everything from Hawaiian to chocolate! It’s a fascinating over view of all the possible variations on this classic dessert. Some of the cakes are made with cooked carrot puree others with shredded, uncooked carrots, some are made with butter and others with oil. For those who don’t know about the Canadian way for selling alcohol, the LCBO (Liquor Control Board of Ontario) is the province run liquor stores, the province has exclusive rights to sell all booze in Ontario. This being the case it is no wonder that the Bourbon Pecan Carrot cake caught my attention. 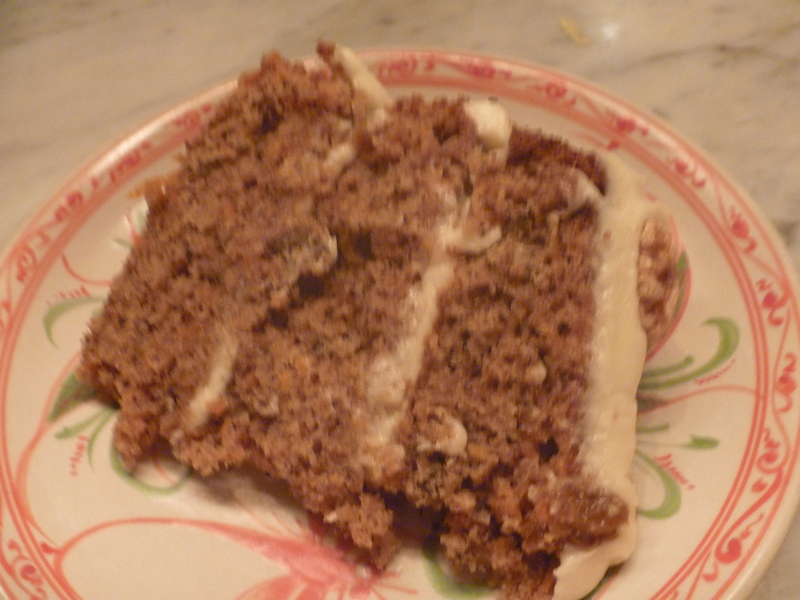 The thing was that I didn’t have enough bourbon nor did I have pecans – also I wanted to make the icing with Mascarpone so what I came up with was Walnut Rum Raisin carrot cake with Mascarpone Icing. With much thanks to the folks at the LCBO for providing me the base recipe with which to play with. Grease generously 3 9″ round cake pans. Grate in a food processor 4 cups of carrots (best to use big loose carrots that have not been refrigerated and don’t come in a plastic bag). In a sauce pan add 1 cup of raisins add 1/3 cup plus 1 Tablespoon of Rum and over medium heat bring just to a boil and immediate take off the heat and lets sit until needed. Lightly toast 2 cups plus 12 whole nice Walnuts (for garnish). About 10 minutes in a 350 F oven. When cool roughly chop (I used the food processor, but a large knife works just as well) the nuts and put aside. Mix dry ingredients in a large bowl: 2 1/2 cups All Purpose Flour (King Arthur or locally grown if possible) 1 Tablespoon of Baking Powder, 1 Teaspoon of Baking Soda, 1 Teaspoon freshly grated Nutmeg, 1 1/2 teaspoon cinnamon, 1/2 teaspoon all spice and 1 teaspoon of Kosher salt. Whisk to blend. In the bowl of a standard mixer using a paddle attachment (the whisk would work also) add: 1 1/2 cups brown sugar (I used golden Demerara), 1 cup organic Sunflower Oil (or any other none flavored oil) 4 large room temperature eggs, and 2 teaspoons of either rum or vanilla. Beat for a full 3 minutes on medium speed. With a spatula add the dry ingredients, once they are fully incorporated fold in the shredded carrots, the rasins and any remaining liquid and finally the chopped nuts. Spoon the batter into the three prepared pans – it should be about 2 1/4 cups per pan. Tap each pan on the counter several times to get ride of any air bubbles and bake for about 30 minutes, when done the cakes will be done and firm in the center. Cool for at least 15 minutes on an oven rack before removing the cakes from the pans. Let cool to room temperature – I let mine sit out over night. When ready to assemble make the icing. In the bowl of a standard mixer add 8 ounces of Mascarpone, 8 ounces of organic Cream Cheese, 1 Tablespoon of Lemon juice and 2 Teaspoons of Rum with the whisk attachment whisk until creamy, turn the machine off and add 1 1/2 cups of sifted icing sugar slowing begin to whisk again until the mixture is well combined. You may need to add more sugar, I don’t like overly sweet icing (I know that seems like a contradiction in terms) which is why I add the lemon juice to give it an edge which is slightly mellowed out by the rum. If you want you can also add a pinch of sea salt. Place one cake on a serving plate and spread 1/3 of the icing over it, cover with the next one and repeat until all three layers are done and garnish with the reserved whole walnuts. Don’t worry that this cake’s sides aren’t also covered in icing – for me this is the perfect cake icing balance also I like the look of the cake not covered in icing, but if you want to double the icing recipe and you are good to go. 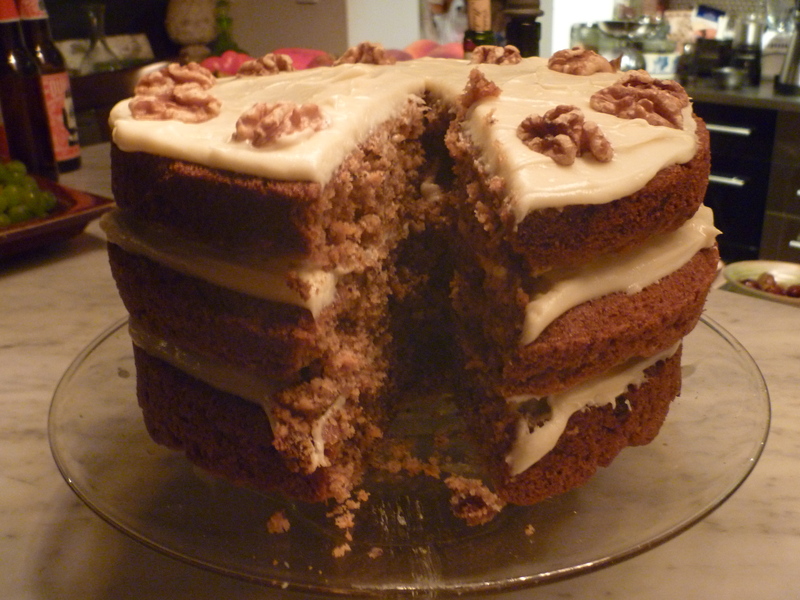 This entry was posted in Recipes and tagged Carrot Cake, Walnut Rum Raisin Carrot Cake. Bookmark the permalink.